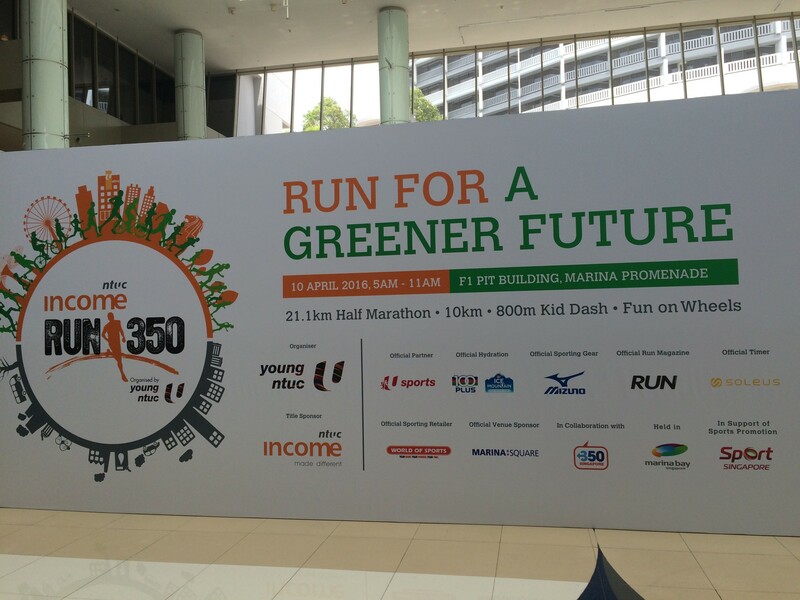 Mind the Runner | JustRunLah! No matter how many training runs you had or how many races you joined, the thoughts that run (pun intended) through a runner’s mind are numerous and varied. Oftentimes, someone would ask me what goes on in my mind when I attempt a long distance race like the half marathon or even the 10km. How do I keep going non-stop for one hour, two hours or maybe three hours? From the moment the decision was made to run a race, my mind is often pre-occupied with it. I will spend a couple of days thinking how I should prep and what kind of mileage I should put in prior to the race; to even when and where I would do my training runs. Closer to the race and just before race pack collection, I would be consider my hydration plan, refuelling strategy and really think about what would be my target timing. 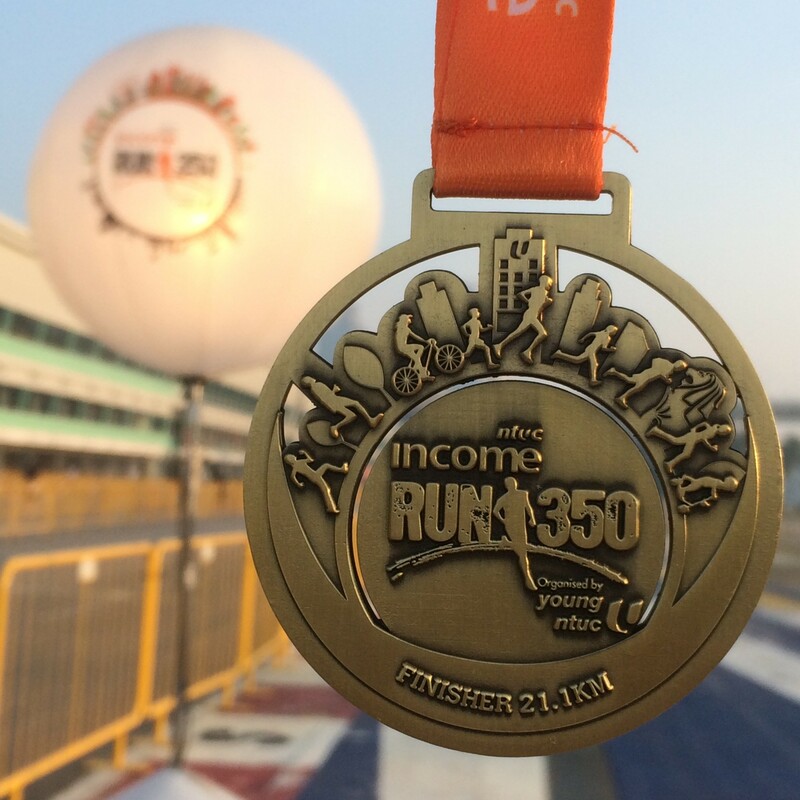 Let me take you through a journey of my mind in the recent NTUC Run350 Half Marathon that I participated. I reached the race village fairly early, around 3.40am. Should I warm up or wait till around 4.30am? I was restless. I took a few sips of water and did some light warm ups. Looking at my watch, it was only 4am and the runners were starting to stream in. Okay, time to go relieve myself and I made my way to the row of portable potties. The waiting, from the queue for the potty to the green light to line up at the starting pen, was getting into my nerves. I thought to myself – why so nervous? After all, this wasn’t my first long distance race. I was too far behind at the starting pen and had to settle with Wave 2. The horn blared and I was off. Finding my rhythm at the start was always a problem, particularly when you were not right in front. I had to weave through the runners who were slower and avoid being clipped by the faster runners. For the first 1km, I had to find my rhythm. A quick glance at my watch showed that I was at 5:45min pace; so I decided to ease back as my experience told me that this was unsustainable. Fighting the urge to go faster at the start of a race was quite normal as the body was still full of energy and raring to go. So my mind needed to order the body to go slower. As the Sports Hub receded from my view, I approached the Geylang Park connector and sighted the dark blue balloon pacers ahead of me. Great, if I could overtake and stay ahead them, then I could be certain of finishing below 2:20. That thought motivated me and I felt the surge of extra energy within me. I picked up my stride and ran towards them. I passed them at the 10km mark and cheered them on. The rhythmic whistle of the pacers slowly faded behind me as I pressed forward towards Marina East area. That place was badly lit and there were a few potholes ready to ambush any unsuspecting runner. 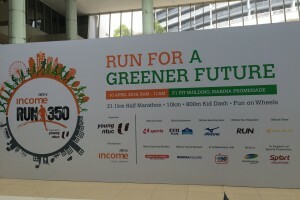 Running with bad lighting isn’t exactly what I thought to be “running for a greener future”. The banana at the 13km mark was a welcome. My mind was starting to get bored. Then, I recalled Coach Lexus of JRL Academy telling us that when he runs a race, he will tell himself a story starting from his childhood days. It’s probably easy for him as he would have reached the finish line before his story ends; just about 70-80mins. For me, it’s double the time, so I need to find something else to keep my mind focused. 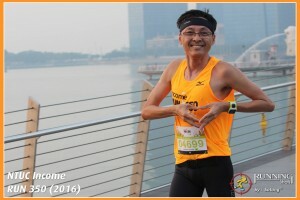 I started to visualise myself running the rest of the route, over Marina Barrage towards the Gardens by the Bay, which was my usual midweek running route. 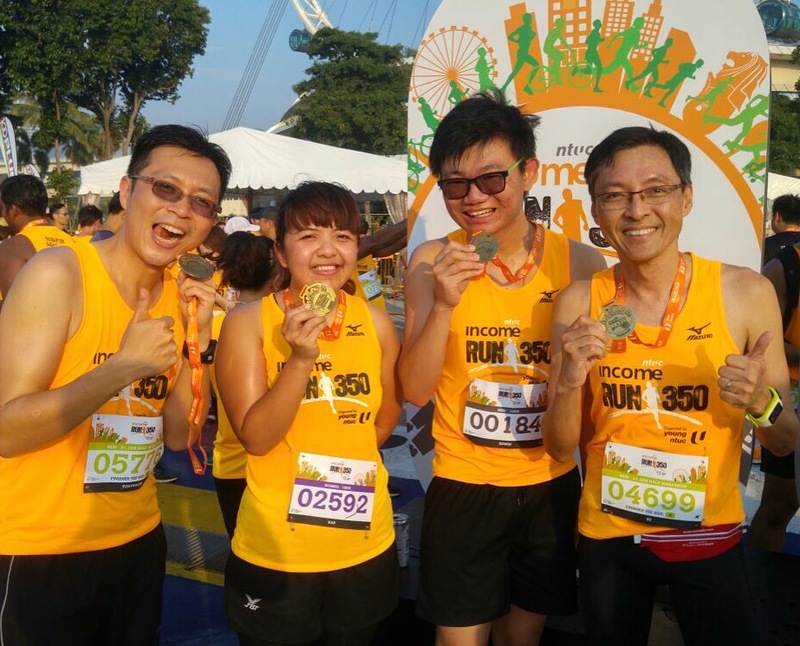 I saw myself crossing the finishing line, claiming my medal and finisher tee, taking photos with fellow runners and basking in the early morning sun while savouring the success of a satisfying race. My train of thought was interrupted by the runners jostling for a drink at the hydration point just before the 16km mark. I downed two cups and pushed towards the Barrage and I knew I was on the home stretch. However, I was wondering whether I could maintain my pace before I hit the wall (hopefully not.) 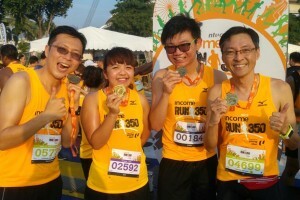 Quickly shaking off this thought, I decided to focus on other runners. I aimed to overtake one runner after another as I started to consume my 2nd gel at 16km mark. The nice thing about a race like this is that you could always overtake somebody. I passed some runners who had their earphones blaring away and I smiled to myself. I used to be very dependent on music on my long runs but I had weaned myself of that. Listening to my body, my heart and my mind is a lot more important in a race like this. There were runners who passed me as well. I just cheered them on and stuck to my pace. Everything seemed to be going as planned as I saw the floating platform at the other side of Marina Bay. Quite unexpectedly, at 18km, I suddenly felt a sharp pain at the outside of my left knee. It really stopped me in my tracks, literally. I started to run with a limp. The pace at the 19km dropped drastically and when the water point loomed into view, I decided that I would walk to pick up my drink and walked a little, then resumed my run. Hopefully, that short rest will help to nurse the knee back for the final distance. While having a knee pain at this stage of the race was a sucky feeling, I realised that I was indeed fortunate that it did not occur at the start of the race. An optimistic mind was extremely important for a long race like the HM. When I resumed my run after the “walk for a drink”, I felt my knee improve significantly. Feeling that I could still run despite the nagging pain, I increased my pace for the last 1km, trying to tell myself that it was still possible to beat the 2:15 target that I set for myself. Struggling to cross the Jubilee Bridge, I spotted the photographer from Running Shots. I told myself that for this hard run, I should not miss this chance to be photographed. Worked up enough energy and smiled for him – yay, he got me! Happy! Quickly, I raced past a few runners and I saw the timing board flashing 2:26 and my heart sank. I knew that wave 2 was about 10mins behind wave 1; so my timing would be more than 2:15. No matter, at least I finished the race in decent time. Running past the finish arch, I picked up my banana, isotonic drink, medal and finisher tee and silently offered a prayer of thanksgiving. After catching my breath, I checked my GPS watch for my net timing; it was about 2:17 – but it also registered a distance of 21.75km. So based on my pace and discounting the extra distance, I actually did run the HM with a timing of 2:13 – and that was a personal best (PB) for me! YAY! Finally, as I looked back at the entire experience, I realised that running the half marathon for an average runner like me takes a lot of the mind to galvanise the body to do the impossible and unthinkable. It seems easy for the elite runners, but for most of us, long distance running is always a mind game. You are constantly choosing the mind over the body; willing the mind to teach the body how to respond. Once the body is subject to the mind, the running becomes a breeze. It all boils down to having a strong will, a steely mind and solid body to go the distance. In case you are thinking too much like me, then just run lah!